Cette réunion se tiendra à Marseille, plus précisément à Luminy (notez au passage les horaires inhabituels). 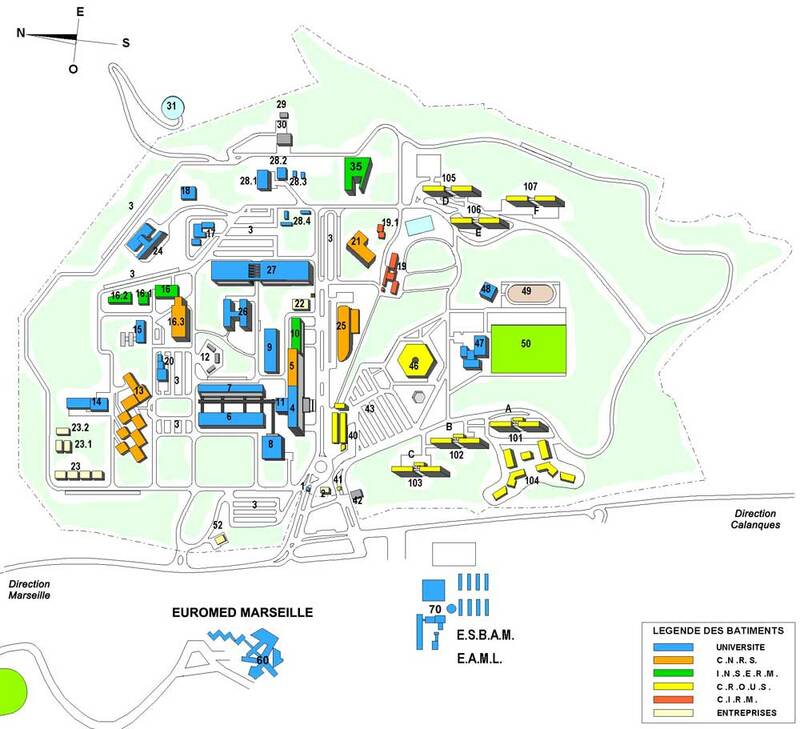 Pour aller à Luminy, voici un lien, et voici un plan du campus. Nous serons le matin dans l'amphi 1 du bâtiment A : c'est le rectangle bleu qui porte le numéro 6 sur le plan. Après avoir déjeuné dans une bonne auberge, nous serons l'après-midi dans les locaux du labo I2M, qui se trouve dans la partie CNRS du bâtiment TPR2: c’est le rectangle orange numéro 5. We describe a framework for game semantics combining operational and denotational accounts. A game is a bipartite graph of “passive” and “active” positions, or a categorical variant with morphisms between positions. The operational part of the framework is given by a labelled transition system in which each state sits in a particular position of the game. From a state in a passive position, transitions are labelled with a valid O-move from that position, and take us to a state in the updated position. Transitions from states in an active position are likewise labelled with a valid P-move, but silent transitions are allowed, which must take us to a state in the same position. The denotational part is given by a “transfer” from one game to another, a kind of program that converts moves between the two games, giving an operation on strategies. The agreement between the two parts is given by a relation called a “stepped bisimulation”. The framework is illustrated by an example of substitution within a lambda-calculus. Classical realizability is a rewrite of Kleene's realizability in order to make it compatible with classical reasoning, following the discovery by T. Griffin of a connection between classical reasoning and control operators. J.-L. Krivine used classical realizability semantics to construct novel models of standard set theory (ZF). I will explain how classical realizability semantics work, how to construct classical realizability models of ZF, and how they differ from forcing models. Notably, each classical realizability model contains a characteristic boolean algebra ∇2, of mysterious structure and weird cardinality. Specifically, I will focus on the model of threads, which showcases these differences. Hypersequent calculus, introduced by Arnon Avron, is an extension of the ordinary sequent calculus that deals with disjunctions of sequents. Historically it has been a tool for studying intermediate logics and many-valued logics (so-called fuzzy logics), but it is interesting in its own right as a proof system with a well-behaved cut-elimination procedure. Brouwer's fixed point theorem and cut-elimination: a potential link. Algebraic cut-elimination a la Maehara and Okada: success and failure. Takeuti-Titani's density rule: elimination and algebraic interpretation.